One of the great things about the Internet, as opposed to, say, law school, is that other smart people will do my homework for me. Last week I said that Obama’s position on the tax cuts was a “moderate-Republican line in the sand” and that the tax deal was closer to the Republicans’ ideal outcome than the Democrats’, but the latter argument was based on some guesses about Republican preferences. Now Mike Konczal has done some of the harder argument, uncovering hard evidence that the Republicans would have agreed to the extended child tax credit sweetener anyway and presenting five points for the argument that the Republicans wanted payroll tax cuts – in particular, they wanted them more than Making Work Pay tax credit that they replaced. This entry was posted in External perspectives and tagged politics, taxes. Bookmark the permalink. How is $3 billion more down the ethanol rathole (worse than just a waste; highly destructive) part of “what we got”? A payroll tax holiday is a highly progressive tax cut. Putting it in “their” column requires saying that all tax cuts are theirs. It might not be something the Democrats were arguing for originally but it ought to be something they’re highly satisfied with… money directly into the pockets of the working poor and middle class. Sadly, I realized Obama was going to show his hand once again, and stiff his own party! The guys got two more years to blame Bush…but my honest opinion is that Bush is starting to look more like a saint to this guy,…JMHO PS. This is an unbelievable statement I just committed myself too – but this guys only interest are “all about himself”! Everything he gets his hands on turns into a desaster! You can quote me on this one. Really confused in Florida??? Only until lower income retirees find their Social Security has been slashed or privatized as a result. The payroll tax holiday is not progressive unless it is accompanied by offsetting increases in higher brackets. I can understand your feelings. Bush was at least effective in getting what he wanted, even if it was bad policy. Obama is ineffective in getting his legislative program through. He is so busy trying to be cooperative that he has sabotaged his own agenda. He perhaps suffers as many intelligent people do in knowing what they do not know. Such problems never bothered Bush. Sadly, all of us are in this mess together and thus are all “we” and “they.” This chart is a conflict producer rather than a clarity signifier. Those who demonize ethanol are prioritizing cheap cheeseburgers over imported crude oil. That’s the trade-off– not ethanol or feeding the hungry in Africa. Most economists are living in the lala-land of 6-8 cents/pound sugar when they knock US corn-based production. And lastly, just how far does a billion dollars toward supporting our vital interests in the Middle East? When talking about ethanol, remember that it is a means to substitute domestic natural gas, coal or any other source of electricity for crude oil imports. Ethanol, which is indeed far from perfect, is still a bargain compared to the alternative crude oil imports. I would put ethanol in this “bridge” category. @Andy: The payroll tax holiday is the first salvo in eliminating Social Security entirely. One-third of U.S. elderly live on Social Security alone. ONE-THIRD. Well, all of us except the top 1 percent are in this together. But–then–why–are–they–winning? And what’s wrong with the rest of us in the 99 percent? As far as Tinbox’s comments about ethanol, as I understand it, ethanol made from Iowa corn, is actually destructive to the environment; ethanol made from other farm products is more efficient, but we still have to worry about environmental degradation, such as destruction of the Amazon rainforest. The lesson of Obama’s first two years in office is, people who waste time waiting for solutions to emerge from judicious study of discernible reality get their lunch eaten by people who move with alacrity to create their own reality. You can’t let the other guy get inside your OODA Loop. “Moderate Republican Stimulus Package 2.0.” that we can blame on Obama when it doesn’t work. Switchgrass would be a great option, but unfortunately the corn lobby is very powerful. They will continue to get the lion’s share of the business, against all advice to the contrary. Once again with the “we” and “they” is once again too many. Nice graph. Point made, except that what really happened is that the plutocrats continued the string by making it a we and they argument instead of a real debate about rational choices to help the average American. Look closely at what transpired. Unless it succeeds in dramatically increasing employment, which is more than somewhat doubtful, it really does very little. And, it is certainly not the optimum answer for the average citizen. It is truly a great answer for every oligarch. And, that’s all that counts for our governing elite, believe me. If you don’t believe that this is what it’s all about, then you are just not watching carefully. Meanwhile, we are wasting so much time on more plutocratic claptrap that there is nothing happening on things like START, immigration, etc. Oh, sure, you can say that next year it will only get worse with the red Congress coming in, but it will just be more of the same. Your construction still assumes mass energy wastage as a given, when my whole project is to move as quickly as possible beyond that. The end of cheap fossil fuel means industrial agriculture as such (not to mention the personal car) is not sustainable. The ethanol boondoggle does nothing but drive up food prices and generate famine in order to chase the chimera of propping up this consumerist car model. America needs millions of small farmers, and it needs them for the apparently radical project of producing food. This is a physical, economic, and democratic imperative. The ethanol boondoggle, just like the rest of industrial agriculture, is nothing but a drag upon us, where it’s not actually an assault upon us. But since this ethanol impetus has played one of the biggest roles in driving up worldwide food prices and generating famine, and is condemning vast tracts of good farmland to unproductive sterility, it’s clear that it’s not just a welfare rathole, but aggressively evil. So yes, it is indeed “demon ethanol”, as even the corporatist Paul Krugman called it. We have to redeem that derelict farmland. Yes, switchgrass was a propaganda meme meant to help generate support for corporatist ethanol as such. But since switchgrass could never be as rent-extractive, it was never intended to be a serious policy option. And that’s only one of its many bad effects. In my comment above I briefly went over them. To reiterate, for the sake of our economic and democratic future, as well as for the bare physical need of growing enough food to eat, America needs millions more small farmers. That’s the only way we’ll grow our food post-cheap fossil fuels, and the only way we’ll create truly autonomous, dignified work again. That means we have to dismantle corporate agriculture, including its consumer ethanol boondoggle. Consumerist ethanol is a pure bad, headed in the exact opposite direction of where we need to be heading. So there must be an observable surge in famines due to ethanol, right? Where are they? Krugman never says and neither do you. You are wrapped up in the same fantasy as Krugman–that farmers would happily grow $2.50/bushel corn or $3/bushel wheat to send to hungry people. Doesn’t work that way. Never has. You didn’t see food riots all over the world in 2008? And continuing over the last 2 years? Gasoline usage should move to its correct market level, shouldn’t it? It shouldn’t be subsidized by the hunger of millions, perhaps billions. Finally, as I already said, farmers should be freed of this predatory commodification scheme to grow food for themselves and their regions. That right there would take care of hunger. It’s called food sovereignty, and it’s humanity’s only way out. But today we live under a totalitarian command economy where all the world’s agriculture, no matter what its actual nature, is forced into the straitjacket of the the commodification practices of a few bankster speculators and Big Ag racketeers. This is probably history’s most absurd and noxious tyranny. It’s morally obscene and completely irrational on its face. And the ethanol racket is a typical part of it. No amount of your veiled neoliberal consumerist propaganda will change the fact that you want to further destroy the economic basis of farming and further starve already-hungry masses so you can burn food to fuel your luxury machines. We don’t need cars, and they’re unsustainable anyway. But we do need food, we do need economic self-determination, and we do need redeemed democracy. The food sovereignty movement is a necessary part of achieving those. @Carla: It may just be the first step towards divorcing ourselves from the idea that SS has to pay for itself. Which would spare us from all the wailing about how the trust fund will “go broke” in whatever year. Ok, so you admit that you can’t point to any famines. Corn is less than $6/bushel. A bushel weighs about 60 lbs. So that means that box of corn flakes has about 10 cents worth of corn in it (you can call it 15 cents worth to account for milling). Today. With all the food we’re burning. Could you eat 15 cents worth of corn in a day? Wheat is about 35% more expensive; could you eat 25 cents worth of wheat in a day? We used more ethanol in 09 than 08 (and even more in 2010) and food prices fell back to Earth with every other commodity. Ethanol was not the major cause of higher commodity prices in 2008. As far as the economic viability of ethanol, I think in order to make a comparison we would have to address the subsidies and tax breaks received by petroleum producers, refiners and shippers along with the Defense costs to maintain security, no? Do you think those numbers are zero? smallish? Fewer cars would be great, but it’s not relevant to the trade-off between ethanol and imported crude oil. I still don’t see why you advocate immediately higher crude oil imports and refined petroleum product consumption. Even if it were cheaper, which is another long argument, it doesn’t seem consistent with your values (which I would guess I share to a great extent). One more thing, I agree with you that continuing the “blender credit” for ethanol is not something that “we got.” It isn’t really a partisan issue with many farm state Republicans supporting it and many urban Democrats opposing it. I can’t think of many high-profile Democrats other than former corn-state Senator, now President, Obama that do support ethanol. With even Al Gore very publicly turning against ethanol recently, it is not a popular program with Democrats. While the Haitian food riots of 2008 may not be directly related to ethanol, they did take place due to the overall increase in the price of food world wide, which in part is related to ethanol. No, Carla, I have no experience in political organizing at all, but I’m ready to join with anyone who’s ready to get active on these issues we continually rehash on these boards. I have nothing against people continuing to talk, but we should do something or shut up. Do you know who I can join with? Does anyone here want to get together and start planning actual activity or public education, or getting the attention of our legislators in an organized, productive way, or something? How do we do that? I donno, Andy. It seems like the “has to pay for itself” requirement may be integral to the fact that SS has stayed more solvent over the past 60 years than about any private or public institution I can think of. Russ: well said. In support your post, consider that all decisions are made in the margin. In a normative market with a marginal-cost model, you maximize profits where mc = mr. With ethanol, in a non-sustainable market with an average cost model, you max participation via an externality race to the bottom (reference the corruption in the Former Soviet Union). Both markets make their decision in the margin, albeit with different approaches. If you want to “move as quickly as possible beyond” the U.S. protecting its “oil pipeline” and its ability to import about 50 percent of its total demand or 4.2 billion barrels of oil annually how do you justify the billions spent on military services required to protect the pipeline? The longer American military personnel are used to protect vulnerable oil installations in conflict-prone countries, the more persuasive becomes the argument to include the growing militarization of our foreign energy policy in the price at the pump (Boyko and Coe, 2005). More importantly how can any free market practitioner advocate the inclusion of bad information (subsidized energy) to thwart effective and efficient price discovery (Boyko, We’re All Screwed, 2009)? #1 Ethanol actually cost more to process. #3 Ethanol in Brazil created this flurry to the magical fuel of alternates because of their humongous sugar cane agri-crop – have you’ve seen the cost/price of sugar? 7# Batteries/Solar & Electric are the only path to the future…their time has come, period! Well, jonboinAR, as I indicated earlier, it is really, really tough. Right now, the best thing I can recommend is to check out http://www.movetoamend.org. This is a coalition of activist groups that are working on a VERY long-term project: amending the Constitution to abolish corporate personhood. This doesn’t mean they aren’t doing anything else in the meantime; all of them are. But as a coalition, they are encouraging people to plan local events on the first anniversary of the infamous Citizens United case–January 21st. They are also planning a major Democracy conference in Madison,WI in August 2011. I hope to be there. MoveToAmend has regular conference calls (organized by state, I believe). Hope this helps. I don’t know how Baseline Scenario commenters can contact each other except we can usually get in touch with those who have their own web sites or blogs. I don’t have either one. One thing you and I perfectly agree on: just commenting on blogs, even good blogs, won’t change a thing. You can say that again. When people talk about “farmers,” in this country at least, they’re mostly talking about corporate behemoths. In the case of corn, it’s ADM (formerly known as Archer Daniels Midland). This is a brutal company. Who decided we should have HFCS sweetening virtually all of our food, even items that never contained sugar in the past? ADM. I fear the only way to get rid of ethanol from corn is to get rid of ADM. It seems odd to me to make the structural assumption that both sides can’t agree on anything at all. The White House’s version assumes that Republicans don’t want the payroll tax cut, while this version assumes that Democrats don’t want it. In fact, both parties want it, and both parties want to take credit for it. 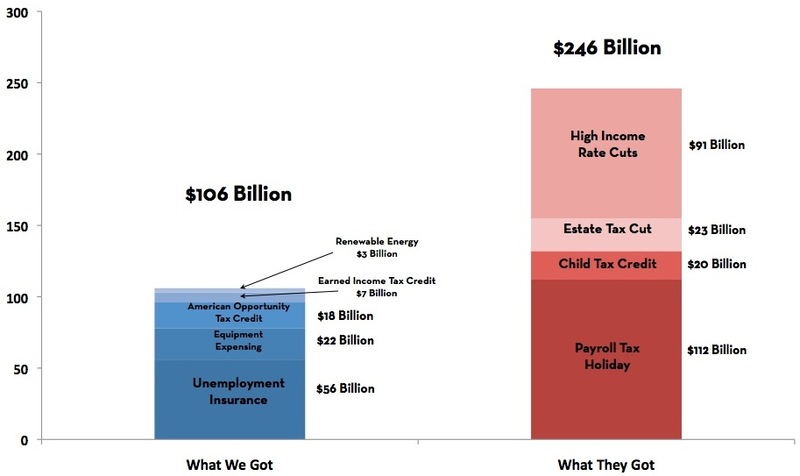 A sensible graph would have a base of $132B that both sides agree on, with $106B of blue next to $114B of red on top. Of course, there’s the idea that it’s a win for Democrats to have $132B of spending everyone wants get passed by a Congress they still control, but I think the electorate already thinks of Congress as being controlled by the GOP. Problem #1: The deal is a stealth attack on Social Security. Problem #2: For nearly one in three workers, it’s a tax increase. Problem #3: The deal has not one but TWO millionaire bailouts. Problem #4: Unemployment help is insufficient and inadequate. While the deal extends unemployment benefits for another 13 months for people currently receiving it, millions of unemployed workers who’ve struggled the most and been out of work more than 99 weeks—since the giant Wall Street banks wrecked the economy—will get no help at all under the deal.4 It’s a gamble that there will be jobs in the next 13 months when the insurance runs out, but the tax cuts will go well beyond that. Better to just pass a stand-alone unemployment extension to help all struggling Americans. Problem #5: Tax giveaways to the rich are a terrible way to create jobs. I don’t understand the argument that corn ethanol replaces foreign oil. The best studies that I have read (from UC Berkeley)show that it take one gallon of gasoline to produce 1.1 gallons of ethanol. When you add in the lower efficiency of ethanol, the yield goes negative. Because we let things like social issues determine whom we are going to vote for. We worry about whether the candidate is Religious/Christian enough. If people would nominate candidates who say these issues are personal and are not a part of a democratic government, maybe we would have real leadership who does not worry about offending the top one percent. Bruce, thank you so much for this. I have printed it out to keep in my purse and pull out in discussions with the (way-too-many-remaining) Obamatons. No, the point about oil imports stands: Fossil fuels are not the same as crude oil. It’s not that complicated; we are not in the Middle East to secure supplies of coal. Do the commenters here realize that more corn is used to produce livestock for beef and pork than is used for ethanol? So why don’t you aim the hunger/famine talk at non-vegetarians ? Nobody uses gasoline to produce ethanol. Other, non-imported sources of electricity are the inputs–generally natural gas or coal. #6 is a bridge, but we’re not up to that bridge. Neither of us has a vehicle that can run on natural gas or propane. #1 and 4 are just at odds with the facts. Wholesale ethanol is cheaper than gasoline today on a per gallon basis; though a gallon of ethanol costs 90% of a gallon of gasoline, it has only 65-70% of the energy content. O.K., tinbox, let’s just say we do. THEN would you drop your defense of ethanol subsidies? Uhm, I think that gasoline is used to grow the CORN that is used to make the ethanol. THEN additional fossil fuels (natural gas/coal) are used to actually turn that corn into ethanol. I could be wrong, but I think that’s how it works. Good point. It’s why the Conservative Christians and Progressives can’t seem to work together. They despise eachother’s social viewpoints. Thanks, Carla. I’ll look at it. I wish I could find a way to get those who are interested enough to post on BS, Economist’s View, Naked Cap, Angry Bear, etc., and who basically share the same views on where the country SHOULD be heading in terms of it’s economy, to band together and begin to work with a little cohesiveness. @ Carla___Indeed, Social Security is in their sites. Ireland has just had its pension funds raided by the IMF, nice! Did you notice today the scavengers in congress piling-on their ear-marks…bloating the bill in a feeding frenzy of fiscal insanity? We’ve got some serious problems? PS. God Bless You…”Julian Assange”! Haha, of course not. I wouldn’t drop my defense of ethanol subsidies. Ethanol still displaces gasoline. My point is that the trade-off is ethanol vs gasoline, not ethanol versus food. Bringing food into the discussion confuses the issue. If the alternatives were a) subsidize ethanol or b) force the US automobile fleet to 10-15% better gas mileage immediately, then I would choose “b.” That’s not on the table. Still, it would be a good idea for many of us to reduce consumption of beef and pork. The USDA says that 8 gallons of diesel and gasoline (combined) are used in growing/harvesting the average acre of corn. An acre of corn yields on average 160 bushels of corn, which in turn yield about 430 gallons of ethanol. Because the ethanol won’t give you the same mileage in your car, the 430 gallons of ethanol only replace 288 gallons of gasoline. So growing an acre of corn for ethanol displaces 280 gallons of gasoline. So why don’t you aim the hunger/famine talk at non-vegetarians ? Because we’re discussing ethanol, not calorie efficiency of eaten grain vs. grain to produce meat. But it’s interesting how you want to change the subject from your bizarre ethanol fixation. (Bizarre if your paycheck doesn’t depend on it.) You refuse or are unable to understand a single word I said. We need the land, and we need it for food. That’ll remain equally true no matter what happens with oil imports, which are going to proceed for as long as they possibly can regardless. I guess you’re just a terminal car-worshipper. You sure have cars on the brain. Yes, I do have cars on the brain. They’re the things that use gasoline. You prefer that sweet, delicious, imported gasoline to homegrown ethanol. Apparently, you don’t care how you get it either. I prefer fewer, smaller cars, but that’s not the discussion. Hey Earl, go frack your own backyard. 50,000 gallons of toxic chemicals per well under extreme pressure just a few thousand feet from our water table and you think there’s no risk? And don’t forget the Uranium and Radium that is all throughout the marcellus formation that formos part of the “flowback” that keeps coming up form each well for the life of that well. PA Laid off 75% of their DEP inspector work force and is physically incapable of performing any sort of meaningful inspections of the 10’s of thousands of new wells that are expected. Clean drinking water for millions of Americans certainly trumps natural gas. Especially when MUCH of our nation’s energy needs can be met through a shift from gasoline to bio-diesels. You like fracking so much, come buy my house which has lost 30% of it’s value since the well went in up the hill from me. The future is that we will continue to use fossil fuels until they are gone or more expensive than another fuel. Period. Nature has conspired to give us a wonderfully energy dense fuel and we have happily created a vast infrastructurre to exploit it at minimum cost. RE: #5 – It is senseless to substitute a carbon-based fuel with another carbon-based fuel that also depletes other important minerals. Save the nutrients in the topsoil for when we will really need them. RE: #6 – When extracting oil becomes too expensive, we will shift to coal. When extracting coal becomes too expensive – we will shift to natural gas. When extracting natural gas becomes too expensive, we will shift to plant sourced carbon fuels. RE: #7 – You will never fly a jet plane on batteries and solar power. We will ALWAYS need a source of carbon-based fuels. Solar panels must become much more efficient and batteries must achieve higher energy densities before they can approach carbon fuels in static and small-scale dynamic systems. We have a LONG way to go. Nuclear Power should be our intermediate future. Using your math that would mean one acre would provide a car with a 12 gal. tank 23.333 fillups. Not knowing how far a person drives in a week but using a tank a week that is only 23 weeks for one car. How many millions of car are on our roads? According to the US Bureau of Transit Statistics for 2004 there are 243,023,485 registered passenger vehicles in the US.According to the Iowa FAct Sheet there are 26,316,332 crop acres in Iowa, the nass.usda.gov site says Ill has about 27 million crop acres. This if we add Indian, Ohio, and lower Wisconsin and Minnesota I am sure we would still not come up with enough acres to for all of the cars out there and that is if we put all crop acres into corn. Soy beans would not be grown, wheat, sorghum, rapeseed (canola), and hay. Petrolium also makes many other things we use daily including the keyboard you are typing on — if it is plastic it is petrolium, and yes soy bean oil can make some of this and honestly does not take food from animals. It is a good follow up crop to corn. Our Diesel is so high here as it is compeating with Europe who uses it more than us in the States. Below is a list of products made from petrolium. And yes Carla fertilizer is one. The reality is ethonal is not there and switch grass is honestly no different. Battery and petrolium hybrid cars are a good start, but the batteries should be a concern as to the chemicals they use. I would honestly like to see some more serious work done on hydrogen and 2020 seems to be the date everyone is pushing for on this. Here we can take polluted water; filter it before making hydrogen cleaning up the enviorment. IT has limits, but with family cars it should work well and then diesal can be left for major hauling. For those who would like to know Obama stopped the work on this. It was part of Bushes 2020 fuel program. And yes, Brenda and Brenda Vinall-Mogel here are the same person. If the only cost of ethanol-based fuel were all down to the competition between food and fuel uses for production, then this critique would carry more weight. Since there are serious problems with the US industrial farming model that remain regardless of what the output is used for, and since the energy budget for ethanol as currently produced is not highly positive, the food-vs-fuel critique is far from the only one handy. You are correct: we cannot run all of today’s American cars on domestic ethanol. Even with ethanol using 35% of the current corn crop, we only displace 10% of the gasoline used. Battery or hybrid cars are great. If there were a program to promote them that cost $3-6 billion annually that was able to displace 10% of the gasoline used, then I would support that too. It would have to be a very big program though. Let’s say you could get 10% of the auto fleet to use no gasoline at all–about 25 million cars (approximately 2 years of US new auto sales). You would have less than $200 to spend per car annually. The limited experience we have so far is that it would take a subsidy far larger than that to induce people to buy battery-powered or hybrid cars. I’m not actually all that attached to ethanol. There are many other ways to reduce gasoline consumption: much higher gas taxes, subsidies for hybrid cars, regulations on manufacturers (CAFE standards). However, those are not on the table at this time. Right here, right now, it’s either ethanol or more gasoline. As if I didn’t already have enough evidence that Obama is either a piss-poor negotiator or a gutless wonder, who got screwed by the Republicans on this deal. But the military needs jets and tanks and transport vehicles. They run on petroleum products. Until we invent or discover a similarly energy dense fuel, securing access to oil will be a military priority. If you want to “move as quickly as possible beyond” the U.S. protecting its “oil pipeline” and its ability to import about 50 percent of its total demand or 4.2 billion barrels of oil annually how do you justify the billions spent on military services required to protect the pipeline? The military protects the pipeline because it serves their interests, not just the interests of the moneyed class. They NEED oil to fuel their weapons of war and move them quickly where they are needed. You can’t fly jets with batteries and solar cells. As long as the US has a military, we will need to protect the carbon-based fuel pipeline to this country. First I wish to say sorry to President Bush for spelling his name wrong and not that he is reading this, but I don’t like it when people spell my name wrong or cannot even pronounce it and I hate doing it to others. Okay, Here we agree in part. I would like to see the Hydrogen work continue as 2020 is really not that far away. We agree it should only be part of the transportation package. High speed rail for 300 mile or less trips, love my new state Gov. already on this – not (Wis). Not that 87 mph is high speed rail either, which is the speed being proposed. That aside I feel with this economy we have a good opportunity to put rail hubs in more densely populated areas basically everything outside of the High Plains with one rail hub every two hundred miles making max distance 100 miles for delivery of goods by rail. Trains for population centres will have to be derived by population and train schedule – limited stops. I feel all trips over three hundred miles by rail is faster by plane, but trains can be a good family vacation idea if you get an enclosed car so children can move around, see more then the clouds, etc. I also believe in small cars, though trucks and vans do have their place. Here is where we disagree. I feel that while the rails need to be State owned like the Interstate system, to get people to change to small cars and trains requires education with real numbers and then the Whys as to why we need to head this direction. I’d love to see a power point 30 min. spot showing why the country needs to go this way for economic, national security, and environment reasons whether they believe in global warming or not. I feel we do not give the average person enough correct information to make good choices and anyone can write a blog, web page, apologies to James and Simon — not everyone, but anyone can write false information for their agenda. A simple ad campaign would be, “Who have you seen on the Train.” And then get leaders (political, celebrities who actually care) to then ride the train. IF they want to be seen and not talked to they can rent a whole car for all I care, but show a bit of actual putting your foot where your mouth says you go would do more than making government mandates. So to Carla and others who said they want a new grass roots group. Let’s start one. You may email me at: Lets.start.a.grassroots.party at gmail.com and we can create a blog spot to get this going. If we were running everything else on electricity, using solar, wind, modern nuclear as our source, we’d have plenty of fossil fuel for plastics and kerosene/jet fuel, would we not, to last for a long time. So isn’t saying we still need fossil fuel for airplanes a bit of a strawman argument, or something? I agree that making ethanol from plants grown in topsoil doesn’t sound too sustainable. The fact that it’s already become somewhat institutionalized due to a lobby that supports it makes me consider that sometimes the right wing has a point about big, wasteful government. Subsidies, once they’ve taken hold, have a robust life of their own that’s often (maybe always) quite immune to any subsequent discovery that what’s being subsidized may not actually be something we really want or need. So isn’t saying we still need fossil fuel for airplanes a bit of a strawman argument, or something? Yes, if that was my entire argument. But it’s not. My response was to earle’s assertion that Batteries/Solar & Electric[‘s]…time has come. It hasn’t. It’s not really that close. Jet fuel was just one example of why it hasn’t. The truth is that we don’t have the ability to produce and store energy from solar power on the scale of fossil fuels. It will take DECADES to get close. If we were running everything else on electricity, using solar, wind, modern nuclear as our source, we’d have plenty of fossil fuel for plastics and kerosene/jet fuel, would we not, to last for a long time. Speaking of strawmen… We are not remotely close to running everything else on solar, wind, and nuclear. It will take DECADES to get there. First we need to develop more efficient converters. Then, we need to develop more efficient storage mechanisms. Then, we need to invest in a whole new infrastructure. This will take time and money. With fossil fuels still relatively inexpensive, the market forces driving the conversion will continue to limp along until the next crisis. Ethanol – is a joke / scam. Hydrogen is not a long-term solution. We are trying to replace fossil fuels. Fuels are energy storage. The work that was done to create these fuels began with photosynthesis and then took millions of years to squeeze into a nice dense little package. Like coal, gas, and oil, Hydrogen is a fuel. It is not an energy source. However, because it is a gas at STP, it is not very dense. It also combusts easily at STP, making it rather dangerous. The storage and safety issues make it a rather poor replacement for fossils fuels. Because it is a fuel, hydrogen must be created or harvested. This requires an energy converter. All of our (nonrenewable) energy comes initially from the sun. Plants utilize sunlight to split water into hydrogen and oxygen and then combine the hydrogen with carbon dioxide to make sugars. After they die and get compressed and heated they convert the sugars to hydrocarbons. When we burn hydrocarbons, we use the opposite process. We would need a similar mechanism as a leaf to split the hydrogen from water and then we would need to store it. Solar cells are our syntetic leaves. Therefore, because hydrogen won’t replace solar cells, (or nuclear or renewables) what would it replace. Batteries. However, batteries are a better mechanism for energy storage than hydrogen. It also removes one more conversion (electrical energy to chemical energy) and is more efficient. Hydrogen is a dead end. Better to invest in solar cells and better batteries. We don’t need this military, and would be much better off without it in every way. I did rather well in my Earth Science classes geology, historical geology, biology, and soils. I am not only a farmer who raises sheep and beef, but a trained archaeologist. So you are not telling me anything about science I do not already know. My family also owns mineral rights to natural gas fields in Canada. As long as there is need, my Dad makes money. Under that I am sure are the things you will need for your batteries and I know they sit under the land I own now — potentually one of the richest areas to compare with the African faults, but under way too much glacial till to be productive in my generation. So while I may not be able to type, when it comes to science I was not born yesterday. BMW, Mercedes, and Hyundai all came out with a hydro car this year. It is not dead. It is just not Obama’s agenda. I meant no offense; I just thought that a criticism of hydrogen needed to be backed up with science. Hydrogen cars only make limited sense in the short term because of current poor battery technology. The hydrogen can be obtained from burning fossil fuels, therefore, it can be quickly refuled using conventional means. When batteries become lighter and obtain greater capacities, the hydrogen economy will quickly fade away. Liquid hydrogen requires energy input to cool it to extremely low temperatures. It will continually evaporate at fairly high rates. Gaseous hydrogen requires large volumes or energy input for compression. I didn’t say it was dead. I said it was a dead-end. As long as there is a promise of near-term profit, companies will invest in hydrogen technolgies. However, hydrogen will never replace fossil fuels or make a significant dent in their demand. That is why it is a dead-end. In the time it takes to mature, battery technology will advance and become a more economical option. ME, TOO. If you find it or form it, I trust you will announce it here. Whatever stimulus the whore masters contrive, won’t mean jack. What America and the world is experiencing these days is the calm before the storm. The world will soon find itself in the same sort of mess that ushered in the first half of the 20th century. The ethanol scheme is a great barometer for what awaits us. @ Blunt. No offence taken. I am actually finding this fun — you cannot know my background if I do not mention it. Apologies on the dead vs. deadend. We will agree to disagree on this issue and time will tell where the markets will take us. I look forward to reading other comments by you. @ Dan-in-PA___Sorry to burst your bubble dude, but blame your corrupt politicians for your problems and personal greed, and that goes for Texas. This was a blatant act of deliberate: by the way natural gas is a natural phenomenon when extracted properly – it’s not the natuaral gas that screws with the aquifiers but the illegal chemical and deadly processing lubricants used. Tell me, has anyone been sent to jail or investigations performed/completed by the State’s AG in question? This was/is obvious corporate sabatage by the energy masters too give “Fracking ” a bad name, period! For “God’s” sake man…a freshman geologist could have seen the outcomes if fracking was performed/initiated in a fragile geography just doing a visual walk through the premises of the local town hall for building variances. These unfortunate incidents were done illegally and with ill-gotten, nefarious motives to tarnish the industry. I’m guessing they did a good job? Every automobile today could be retrofitted with natural gas fuel systems, and as far as infratructure – give me a break. Yes, fly your airplanes, and run your tanks, fuel your fleets, take “Airforce One” ($2 million/hr.) all over the world, but in proportion to our daily energy needs, it’s infinitely miniscule. Face it…it’s a fossil fuel, longing to be back with the dinasaur’s from which it came. Yours’ and others rationale as too thinking “petroleum” is just TBTF makes me nauseous. Granted, there are still plenty of industrial uses (just common sense is enough for discourse here?) but as a main source of “America’s transpotational fuel du`jour…it has seen its days my friend. I am saddened by your situation, but when these fly-by-night companies come in to town, and promise great riches from the “Blue-Gold Mines” below in your very back yard…you should have thought twice. Lastly, “Ethanol is a joke! Our congress just gave another couple of billions for its proliferation, nice! What happens when there’s a draught? Lastly, Deep Water “WindPower” is happening in Maine…out of site, and mind, but will be capable of facilitating enough electricity for all of Maine, and selling the known surplus to lower the fiscal budget. Not to be outdone by paying the cost of its expense with realitive ease, freeing up cash. This should be on-line in 2014? PS. Stay with “Oil” – you our literally condeming the free world to WWIII? HEY EVERYBODY: As Brenda says in a comment farther down, email lets.start.a.grassroots.party@gmail.com. Sounds like an organizing initiative to me! At the risk of veering WAY off topic: really? Really? Do you have insurance, Russ? People carry insurance to protect what they have against low probability, high risk events. Military is insurance against the low probability, high risk event of another country trying to destroy our way of life by force. Reasonable people can argue about the size and scope of the current military. But it is difficult to argue that the military is unecessary. There are bad people in this world Russ. They are unreasonable and will go to any means to get what they want. If and when they seize power, we want to make it dangerous and practically impossible for them to try and take what they want from us. History is littered with the corpses of peaceful men who found their opponents arguments punctuated by the thrust of the sword. @ Dan-in-PA___So your sickened by your water? Ref: “In Nigeria, Oil Spills Are a Longlife Scourge” – NY Times…Please let us not selfishly forget our own Gulf? I believe the scope of the discussion needs to be broadened to include “uncertainty” –reference the following excerpt from forthcoming white paper. Change is the reflexive exchange of risk and uncertainty. Managing change is the process by which we evolve as a society. In a world of financial complexity, innovation, and bubbles, the main focus of managing change should be randomness. A rarely identified factor that stands as a constant obstacle to the effective and efficient management of change is the relationship of the component parts – predictability, risk, and uncertainty – to the connective concept of randomness. Randomness is the range of variability of a complex adaptive system. The primary concern is to determine how wide the tolerances may be without affecting the outcome of commercial activity by specifying the largest possible tolerance that preserves functionality. Tighter tolerances are more difficult to achieve but enhance the quality while looser tolerances are easier to achieve but may adversely affect the operation. In determining the degree of randomness the component parameters of predictability and risk can be bounded whereas the component of uncertainty cannot be bounded with any degree of precision. But uncertainty must be considered. Ignoring uncertainty is done at one’s own peril. We argue that one-size-fits-all governance metrics are too loose an operational tolerance to be functional because they lack clarity and precision due to non-correlative information such as Too-Big-To-Fail (TBTF) financial institutions that are, in reality, Too-Random-To-Regulate (TRTR). With due respect, I can’t see exactly where you are going with this, except an excuse to print your excerpt. Which view of the “necessity of the military”, or “ethanol subsidies”, or “whether the republicans got the better part of the tax deal” do you support? If I read you correctly, you support recognizing the need to consider uncertainty. Fine. I’m with you on that. Now how do you plan to tie that back into the original topics? The greater the scope of terrorist randomness, the greater the energy scale that is necessary for a response. But you have to get byond deterministic predictability and risk to consider indeterminate uncertainty, which is unbounded. To amplify my response above, consider that energy is to the real goods and service sector, as capital is to the financial sector. How would you conduct an energy stress test for the real goods and service sector of the economy? Would it include uncertainty, or would the legacy one-size-fits/fails-all deterministic model continue? Military is insurance against the low probability, high risk event of another country trying to destroy our way of life by force. Reasonable people can argue about the size and scope of the current military. But it is difficult to argue that the military is unecessary. I thought I was arguing about the size and scope. Tremendously downsize it. Purge all corporate welfare from it. Completely dismantle the empire, which does America no good, only harms it. And it’s long been proven that the only thing which generates terrorism and general hatred for America is this government’s own corporatist aggression. End that and you end the problem. I know that all too well. America has hideous enemies. And they are all right here in this country, homegrown. They’re the banksters, and the CEOs, and the corrupt politicians, and the bootlicking hacks. The military serves them, not the people. The corporations and government want to turn it against the people, if the militarized police aren’t sufficient. So yes, where it comes to this issue the best thing possible for the people would be to restore one of the core founding principles of America, that a standing army is a clear and present danger to freedom, and a moral affront. Unemployment insurance shouldn’t be completely on the “we got” side. Grassley and other Repubs have stated that they were planning to extend unemployment insurance for non-99ers, though perhaps for a shorter period. The amount ought to be halved to about $28 billion or so to make the chart accurate. Your thoughtful responses require more thorough comments than I have time to deliver at present. Expect a follow-up soon. What other country can possibly harm America or its interests? Any country that disrupts the flow of cheap energy into this country would dramatically harm America and its interests. It is only because of our ability to project force across long distances that we can protect our interests. Radically dismantling the military would diminish or eliminate our ability to project this force. We would also display our unwillingness to protect our interests. I suspect that this new reality would impact their long and short term strategic plans to our detriment. Provem by whom? Where’s the cite to the research? Ending our “corporatist agression” would not end terrorism. The terrorists do not want to be left alone. They want to cripple us. Dismantling our military will only give them the opportunity to accomplish this. America has hideous enemies… They’re the banksters, and the CEOs, and the corrupt politicians, and the bootlicking hacks. They are not the only enemies that we have. There are many external enemies that lie in wait for a weakened America. Our subjugation to our internal masters is mostly self-inflicted. We have benefited vicariously, so we capitulate to their largesse. We will not benefit AT ALL if we become subjugated to outside masters. They will have no interest in keeping us fat and happy. History is written by the victor. It tells us of great generals and kings and politicians and how they utilized the labors of the weak to immortalize their deeds. It also informs us of the lives of weak. Throughout history, the average human lived a life that was “poor, solitary, nasty brutish and short.” We have been fortunate to live in a time and a country where we have been the exception to this rule. However, our good fortune is not inevitable or guaranteed. A strong military is necessary to defend us from those who have us return to those hard times. I believe that energy subsidies need to be viewed reflexively in the context of geo-political realities and strong vs. weak dollar. Much like a pilot who has 20/20 vision but lacks depth perception, policymakers using 2-D convention for a 3-D robust market will likely crash no matter how hard they try, or how smart they are. Before you think outside the box, you have to be able to think outside the square. Take your time. I look forward to your response. Re: @ tinbox___We’ve[I] mentioned subsidies for “Ethanol” going to the largest “Agri-States”? Here’s what they did not do in the first half of the 20th century – they did not take a “time out”. FIAT money, no less. That’s what really makes it beyond human evil and into theoretical iniquity…. Okay – let’s go with that. and no FIAT money to un-trash Spaceship Earth. but here’s the catch – ready? and have a Constitutional Convention. What part don’t you understand about the FACTS of STUPID people? A mortgage company – didn’t even say WHICH one – just robocalled the new phone line – and told me to “hit 1” for “help with making mortgage payments”. And when a business model from the early 1990s was brought up as a “cut and paste” template for how to get people better diabetes management, an eastern block MD called it “utopia” and sneered at WHAT WAS BEING DONE BEFORE THAT WAS GOOD. or repeat the Civil War.